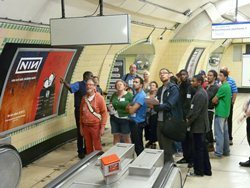 London’s transport heritage isn’t just about the vehicles; there is also a lot of very important legacies in the network infrastructure. Perhaps one of the better known parts is the architectural work of Charles Holden. 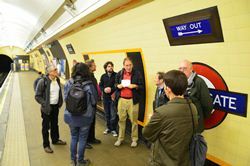 I thought I knew it – until I was lucky enough to join the trial run of a new walking tour that the Museum offered to the public as part of the London Festival of Architecture summer programme, which ran throughout June. 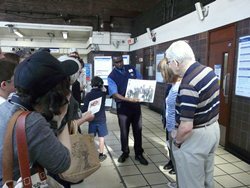 Ten of us met at Oakwood station, at the outer reaches of the Piccadilly Line, including our guide for the tour, David Burnell, a long standing Friend of the museum and, more recently, volunteer. David started us off with a knowledgeable discourse on the history of the roots of Holden’s involvement in Underground architecture and the styles that influenced him. Next was a very informative and discerning explanation of the result, using both the interior and exterior of Oakwood to demonstrate the story. What did I learn? Well, art deco isn’t a type of architecture; it’s the design features. The architectural style is generally described as ‘British Modernism’. And Holden only designed one half of his stations, the street level elements. The rail level design was the responsibility of Stanley Heaps, London Transport’s in house architect. They certainly gel well. From Oakwood we caught a Piccadilly Line train one stop south to Southfields station, another Holden masterpiece, to my eye reminiscent of something from a Buck Rogers comic strip. Under David’s expert eye we also took a 15 minute walking detour via a fine selection of Edwardian suburbia. 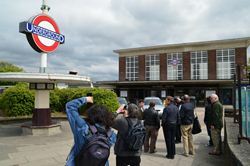 Back at Southfield, we again took a train to Arnos Grove, the third in our trio of Holden’s, featuring a rectangular street building as at Oakwood. David again gave us an excellent overview of the main features of the building. Ever a glutton for punishment, I stayed on for the optional one hour walk through Arnos Park to Abbotshall Avenue, to see a fine row of 1930s Modernism houses, not to mention a detour to see the Arnos Park viaduct of the Piccadilly Line, an imposing brick edifice.